You are invited to the Table!!! I'm advertising this on my wife's behalf (she's one of the organizers). The ladies will be staying and meeting at the Sandcastle Oceanfront Resort in Virginia Beach. The theme will be "A Seat At the Table" and will offer many 'table gatherings' (sessions) to choose from as well as plenty of time to enjoy our beautiful surroundings. The goal of this gathering is to facilitate discussions that are directly related to women, encouraging them to boldly emerge as leaders in this 21st Century. The conversations are inclusive of a diversity of leadership styles and opportunities. The sessions will enable all women to have a voice at the table to dialogue, to learn and to advance their journeys of Christian spiritual formation. The registration fee is nominal and 'scholarships' will be available to those in financial need. Lodging, transportation and meals are not included. All women are invited to join us at this table, and are encouraged to invite others as well. Please spread the news of this event to any women you know interested in the emerging church conversation. 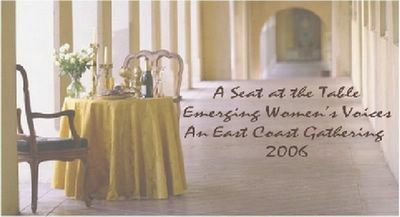 Emerging Women look forward to sharing a place at the Table with you!